Ward's® 1100 Visible spectrophotometer is perfectly designed for high school and college students completing general analysis and experiments such as Beer-Lambert, Absorption Spectrum, Transmittance, Chlorophyll, protein (biuret test) and more. An included visible wavelength spectrum chart on the instrument panel allows the user to make the correlation between a wavelength number to an actual color on the visible light spectrum. The built-in secondary filters reduce stray light and increase precision. The design is "Student-Proofed" making this a durable unit for years of use. Large digital display makes reading much easier and the new USB interface allows for the collection of data via a computer. 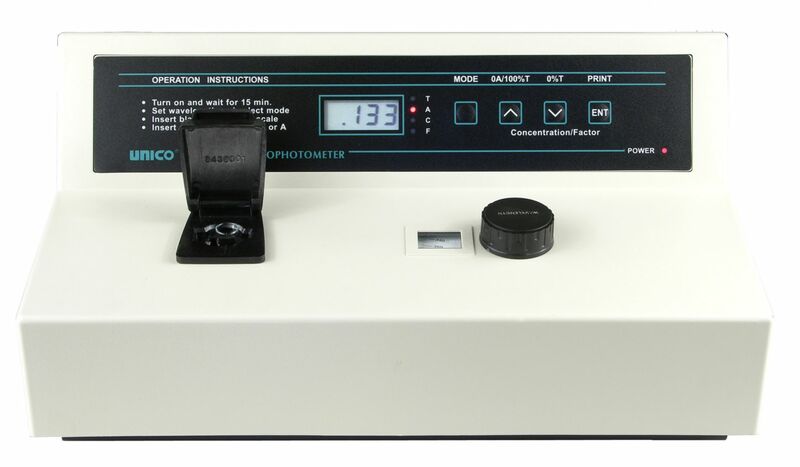 This spectrophotometer is designed for use with 1/2" (13 mm) round tubes or 10 mm square cuvettes. an adapter is supplied at no additional charge for 10mm square cuvettes. High quality silicon photodiode detector and 1200 lines/mm grating assures high performance. Auto zero function, one-touch blanking and built-in automatic filters for easy operation. Large digital display allows for quick and easy readings. Optional Windows(R) based software for easy data collection and application expansion to Standard Curve and Kinetics, Abs. and %T is available. Data can be easily exported to Microsoft Excel(R) for further processing and analysis. The software is designed for Windows based PCs, using Windows 2000, ME, or XP. Model 1100 measures Absorbance, Transmittance and now includes a USB port. Ordering information: Each comes complete with a manual, 12 round optical glass cuvettes, a square cuvette adapter, and dust cover.